An Edvard Munch painting worth an estimated £70,000 has been stolen from a private home in southern Sweden. Police tightened up border controls after the theft from the manor house near Horby, about 360 miles (580km) south of Stockholm. "The thieves just broke open one of the doors, removed the painting and left," police spokesman Per Jansson told the Associated Press news agency. 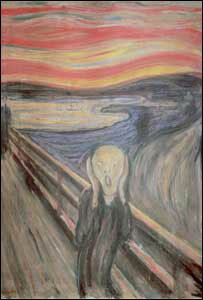 A version of Munch's The Scream remains missing after being stolen in 2004. Police said they did not know the title of the painting taken in the latest theft, which happened late on Tuesday. Two masked armed robbers stole versions of The Scream and Madonna from the Munch Museum in Oslo, Norway, in August 2004 as gallery visitors looked on. The thieves have not been convicted and the paintings are still missing, despite an international search and the offer of a reward. Earlier this month, three men were jailed for up to eight years for being accomplices to the heist. The Norwegian artist died in 1944.